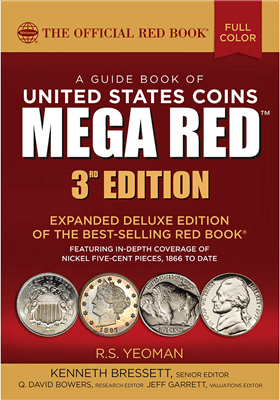 (Pelham, Alabama) — The third edition of MEGA RED (the Deluxe Edition of the Guide Book of United States Coins) features several new appendices covering hobby-related topics. One is a 10-page illustrated study of chopmarks and chopmarked coins by Colin Gullberg, founder of the Chopmark Collectors Club (a member society of the American Numismatic Association) and editor of Chopmark News. MEGA RED retails for $49.95 and is available online and from booksellers nationwide. The author begins with a history of how silver flowed throughout the world, and especially into China, from the 1500s through the 1800s. He explores the influence of Japan in silver exporting, Europe’s China Trade, and important silver trade coins such as the Spanish 8-reales “cob,” Mexican Portrait or Bust dollars, Pillar dollars, and the famous U.S. trade dollar. 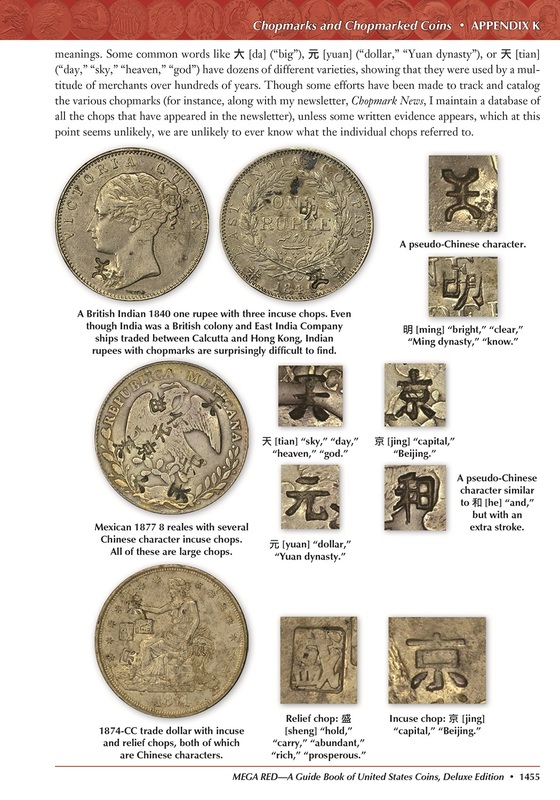 The study is illustrated with 30 photographs of U.S. and foreign coins, and types of chops including incuse and relief, large and small, Chinese characters and pseudo-characters, and even ink chops. Gullberg also discusses and illustrates assay chops and wedding chops. For collectors, Gullberg analyzes three broad categories of pricing for chopmarked coins: Group 1, comprised of common trade coins from the United States, Britain, Japan, France, and Spain, made specifically for business use in China or commonly circulated there; Group 2, very rare coins, including key dates or mints from Mexico and other countries; and Group 3, non-trade coins commonly found with chopmarks, including Morgan dollars, British shillings, Salvadoran pesos, Russian roubles, and others. He then lays out his advice for collecting chopmarked coins, giving strategies for focusing on American coins, non-U.S. coins, type coins, and collecting by chop. The third edition of MEGA RED officially debuted at the Whitman Coin and Collectibles Baltimore Expo, March 30, 2017, and now is available nationwide. MEGA RED retails for $49.95 and is available online (including at Whitman.com) and from booksellers and hobby shops nationwide. Whitman Publishing is the Official Supplier of the ANA, and Association members receive a 10% discount off all purchases. Whitman Publishing is the Official Supplier of the American Numismatic Association. As a benefit of membership in the ANA, members can borrow the Red Book (and other Whitman books) for free from the Association’s library, and also receive 10% off all Whitman purchases. Details are at www.money.org.